Experience God’s grace with familiar melodies played on the soothing Celtic harp, ideal for listening and meditation. 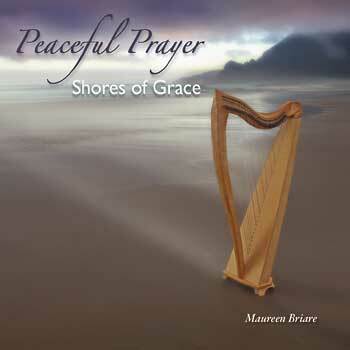 Featuring instrumental arrangements of 12 traditional and popular hymns and worship songs, Maureen Briare’s latest instrumental endeavor continues in the same vein as the first volume, Peaceful Prayer: Sacred Melodies of Comfort and Hope. Perfect for anyone seeking a peaceful respite, this unique collection of Celtic harp music draws listeners into the abundant hope and comfort of God’s love and grace. Designed to reflect natural rhythms and soothing tempos, Maureen’s beautiful harp arrangements lend themselves perfectly to peaceful and relaxing listening. Though the harp is featured, you’ll hear a variety of other instruments, like oboe, cello and violin, throughout the recordings. From “Pacem,” an original composition inspired by Maureen's experience playing at a hospice service, to the recognizable “For the Beauty of the Earth Medley,” the prayerful songs on this collection will surround you with a sense of calm and serenity.